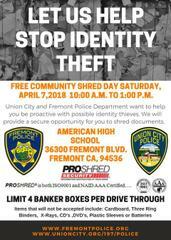 Free Community Shred Event Saturday in Partnership with Union City PD - Together we can help stop identity theft! We are partnering with the Union City Police Department to help our community members take proactive steps to help prevent identity theft. On Saturday, April 7, 2018, from 10:00 a.m. - 1:00 p.m., our agencies will provide a secure and convenient opportunity for you to shred confidential paper documents with PROSHRED® at American High School, located at 36300 Fremont Blvd. Residents can bring up to 4 banker boxes of material to discard and shred at the event. No need to remove paper clips, staples, hanging file folders, etc. All documents will be shredded immediately on-site, during the event. If you’d like tips and advice on whether or not you should discard specific documents such as tax returns, bank and credit card statements or pay stubs, we have included some helpful guidelines below. Q: How large is a banker box? A: A banker box is approximately 12” x 10” x 15”. Q: Do I have to use an actual banker box? A: No, it is only used as an example for size. Q: Can other items be shredded? A: PROSHRED® will unfortunately not accept any of the following items: cardboard, binders, x-rays, cd's, dvd's, plastic sleeves or batteries. Q: Is there a limit to the number of drive-thru’s a community member can make at the drop-off location? A: There is no limit to the number of times a community member can drive through and drop off documents. Each drop off is limited to 4 banker size boxes. Q: Do you have to carry the boxes a far distance? A: No need to carry anything. You simply drive up, park and a PROSHRED® employee or volunteer will retrieve your boxes, dump them into a bin and return the empty boxes to you. The documents will then be shredded. Q: What will happen to the shredded paper? A: 100% of the shredded materials will be recycled. Q: Is this limited to residents only? A: This is a community-wide event. The event is open to residents, businesses and non-profit organizations. Q: Can you tell us a little more about PROSHRED®? A: PROSHRED® is a locally owned and nationally supported company specializing in secure mobile document destruction. Our clients can be rest assured that their most sensitive and proprietary materials are destroyed onsite in our state-of-the-art shredding vehicles...prior to leaving their facility. Business, home-office and residential clients have entrusted PROSHRED® to maintain their information security, legislative compliance and personal and professional privacy for over 25 years. ProShred is both ISO9001 and NAID AAA certified. • Tax returns: The IRS has three years to challenge information in your tax return and six years to conduct an audit based on unreported income. Keep tax returns and supporting records, such as W-2s and 1099s, for at least seven years in a secure place, such as a lock-box. • Investment statements for taxable accounts: Most brokerage firms and mutual fund companies send annual statements summarizing the year’s transactions. Once you have these, you should shred your monthly and/or quarterly statements with a confetti-cut shredder. • Bank statements: Keep statements that back up information on your tax returns for up to seven years. Other bank statements can be shredded after reviewing for errors or unauthorized charges. • Credit card statements: Keep statements for major purchases, like jewelry or large appliances in case the statements are needed for warranty documentation. If you put charitable contributions on your credit card, keep the statement for your tax records. Other monthly statements can be shredded once you’ve reviewed them for errors or unauthorized purchases. • Unsolicited, Pre-approved credit applications: Unless you plan to take the offer, shred these documents. • Pay stubs: While many people recommend saving these, it’s really a mistake. Pay stubs contain everything an identity thief needs to open an account. Keep three months of history only if you are planning to apply for a mortgage. • ATM receipts: Shred all receipts after you check your bank statement for errors or unauthorized charges. • Canceled checks : Unless they are needed for tax returns or other documentation purposes, canceled checks should be destroyed after one year. • Retirement plan contributions: Keep records of contributions to non-deductible individual retirement accounts, such as a Roth IRA, indefinitely. Without them, you may find yourself paying taxes again when the money is withdrawn. Some financial institutions keep records of IRA contributions, but it’s best not to count on it. • Insurance policies, wills and other legal documents: These documents should be kept indefinitely in a secure place, such as a lock-box. Visit our Facebook page and share the event with your neighbors!